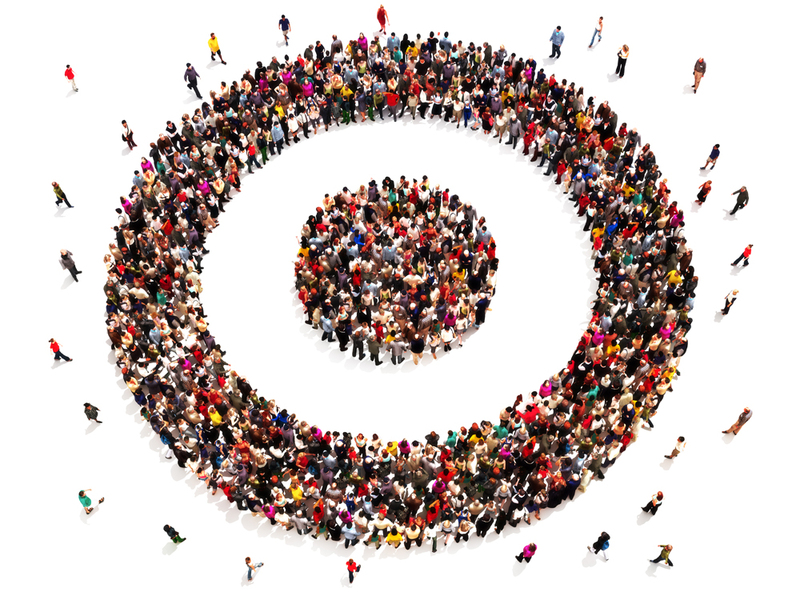 Aggressively pursuing a target audience is not a marketing mistake; pursuing too many is. As product and options continue to grow in virtually every industry, you can’t be everything to everyone. It’s vital to precisely identify which specific target market segments will yield the greatest return on investment. It’s better to own three segments than be an-also ran in 10. Then you can think about expanding your marketing efforts. 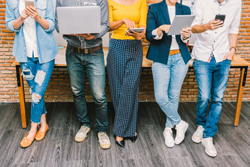 Here are some things Integrated Marketing Services and our wholly-owned research company, American Opinion Research, have learned about finding the audiences with the most potential. Market research is the most used and most effective approach to identifying your best target audiences. Research will pinpoint the unique groups which represent the greatest sales potential. Focus on those, and you’ll be investing your marketing dollars where they will produce the best results. Determine what really motivates these targeted customers to make purchase decisions. Sure, productivity, cost, prior experience, referrals, product features, etc. are all major considerations. But motivations are often emotional as well as practical; security and insecurity, confidence, pride, etc. In fact, a wide variety of research has shown that emotional benefits often outweigh products or services when making a purchase decision. Again, research can identify these hot buttons. Use this information (with your agency, if you have one) to develop precise targeted marketing messages that will motivate customers in each segment, but all under the umbrella of your overall brand positioning. Strategic marketing starts with choosing segments with the most immediate sales potential, then developing and conveying marketing messages that resonate with buyers. But you can’t stop here. Continue to prove and support your leadership in the segments you’ve chosen. Developing white papers, partnering with key opinion leaders on articles and projects, sharing industry research, media outreach, etc. all help build credibility paid advertising cannot. In other words, aim the arrow at the bullseye. Think about the customers you’ve had and lost over the past five years. Then think about what it would mean to your business to recapture just a small percentage of them. That’s often the result of a good customer reacquisition program. It’s generally faster, less expensive and more efficient to reacquire an old customer than develop a new one. Give preference to those with which you had a good relationship. Don’t forget about the rest, but focus first on those which you have the best prospects of reacquiring. You also have to ask yourself a hard question: do you want this customer back? We all want to win as many customers as possible, but some are very difficult to work with, and can even disrupt the morale of your staff. Others demand more work than the budget justifies, sometimes, it’s just a bad fit. “Stop studies” among former customers can determine why they really quit (not what they say top-of-mind) and how to get them back. Often the reasons have nothing to do with quality and service, or even price. If there was a problem with your products or services, fix it, visit the former client, apologize and explain how you have corrected the problem. Ask for another opportunity. If possible, think of something you did or shared…” What was the name of that restaurant we…” or, “I was talking to…and your name came up.” Or, simply say you haven’t worked together for a while and you want to see how to get back together. You may have to take a few small projects or orders to start rebuilding your relationship. 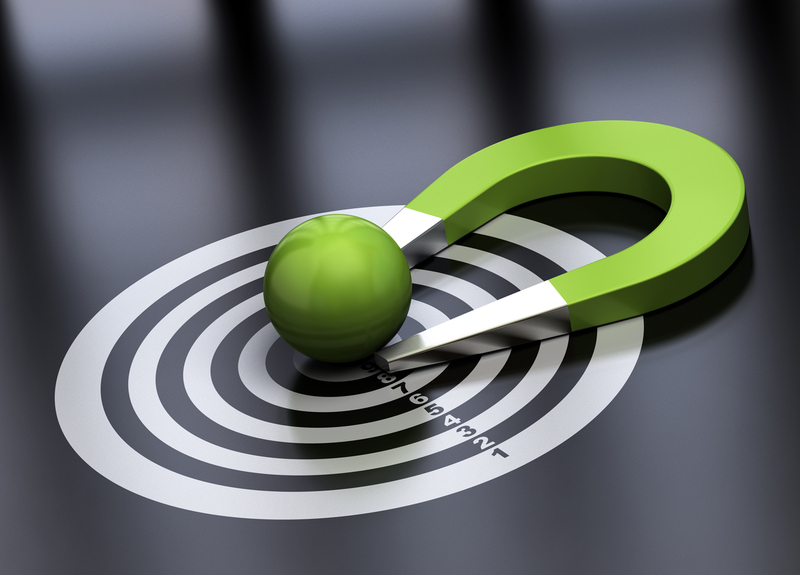 Regardless, targeting former customers may be one of your best strategies for attracting new ones. The iconic Marlboro Man marketing campaign, considered one of the most successful ever, began in 1955 to convince males that smoking filtered cigarettes was not feminine (they were first introduced as a woman’s cigarette). 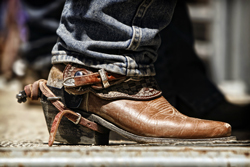 The ads originally used a number of different characters, but the rugged cowboy image stuck. Ironically, four men appearing in the Marlboro ads died of smoking-related causes, according to the Los Angeles Times, but not before several appeared in anti-smoking commercials. 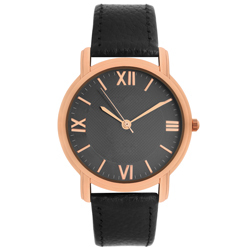 Although there are some variations, watches in advertisements are generally set at 10:10. One reason, the hands resemble a happy face. Why wear jeans on Fridays? Although generally considered a relatively new development, dress-down Friday actually began about three generations ago as a way to boost worker morale. It really took off in the 70s, when clothing manufacturers began promoting it as a way to increase sales. Before World War II, diamond engagement rings were relatively rare; now, they’re almost the rule. What happened? Sales took off when the De Beers® diamond cartel launched a huge campaign linking diamonds with engagements, according to the BBC. The campaign was specially aimed at women and even suggested the ring should cost two-month’s salary. Not sure if that works today. The legend of St. Valentine has been around for more two thousand years; the tradition of giving candy is much more recent. 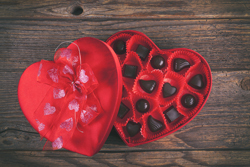 In the mid-1 800s, Richard Cadbury, of the Cadbury Candy Company, launched a large marketing campaign tying chocolate to the celebration of Valentine’s Day to help launch a new company line. Cadbury also designed the first candy box, including the elaborate boxes in which Valentine candy was sold. FYI, in Japan, women sometimes give chocolates to men. IBM wasn’t really selling business machines, although those were its products; it was selling security. IBM was then considered “the best”, and purchasers felt nobody lost their job for buying the best. Mercedes current campaign, “The best or nothing,” plays into these emotions. To help increase the sales of SUVs among females, an automaker once ran a commercial showing a woman at home alone with just her child. It was dark and rainy but she had to drive to the hospital, bad weather or not, when her child suddenly became ill. The commercial was actually selling safety and security. How many cell phone ads have you seen promising to connect users. They are appealing to the emotion of “belonging”. 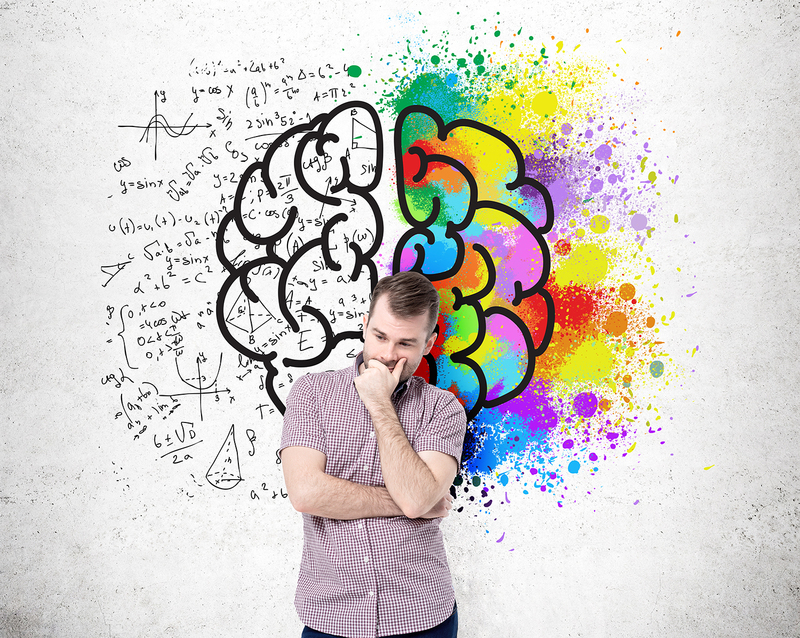 Psychology is defined as “the science of mind and behavior,” and few things are more important in marketing than motivating customer behavior. Understanding the psychology of buyer groups allows us to understand and tap into their emotions. In fact, a wide variety of research shows that emotions play a more important role in a purchase decision, business-to-consumer or (as with the IBM buyer above) business-to-business. American Opinion Research (AOR), a division of Integrated Marketing Services, once conducted research for a company targeting healthcare professionals and institutions to increase sales of its medical device. In a research study of doctors and buyers, AOR asked, “What brand of (the specific type of equipment) would you want if a friend or relative were on the operating table?” and why. The results provided vital insight into customers’ emotional hot buttons, and formed the positioning for a very successful marketing campaign. Integrated Marketing Services has coined the term “emotional engagement,” to describe this marketing approach, which also usually results in more satisfied, loyal customers. Emotional engagement is important regardless of the marketing channels you use and whether your company is selling business-to-consumer or business-to-business. Your consumers and potential customers all have emotions. Sure, you can learn something by simply talking with customers, but the vast majority have a difficult time expressing their feelings, and almost never articulate how these feeling turn into emotions. Traditional focus groups are also ineffective; placed in a room with other people participants often lean toward conformity. Today’s, more sophisticated market research techniques go well beyond measuring customer wants and needs, using more advanced psychographic analysis to pinpoint emotional messages that will motivate buying decisions. We can then segment audiences into mutually exclusive groups, each of which respond to different messages whether they are user groups, procurement officers, C-suite executives or others. This type of research can also identify potential new products and services. Negatives prompt such emotions as fear, anxiety and insecurity. Providing a positive alternative or solution to a negative can change these emotions to peace of mind, confidence, security – all buying motivators and differentiators for your products and services. The message also differentiated FedEx from competitors. But, be very selective. Avoid the common mistake of choosing a visual because it’s pretty; make sure it advances your message. Videos with an emotional connection are shared more often than those that don’t, but they need to be short and to the point. Online testimonials focusing on the impact of a product can spark an emotional response, including belonging, surprise, and others. 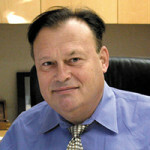 Based on Integrated Marketing Services’ experience, a few of the emotions which have proven to affect business buying decisions include, confidence, self-respect, fear, security and insecurity, envy, compassion, hope, disapproval, optimism, annoyance, anger, aggressiveness, optimism, trust, apprehension, and others. The trick is to determine which of these emotions, or one of many others, motivates your target buyers. Poor pre-show planning: entice potential customers to your booth, don’t just hope they walk by and stop in. 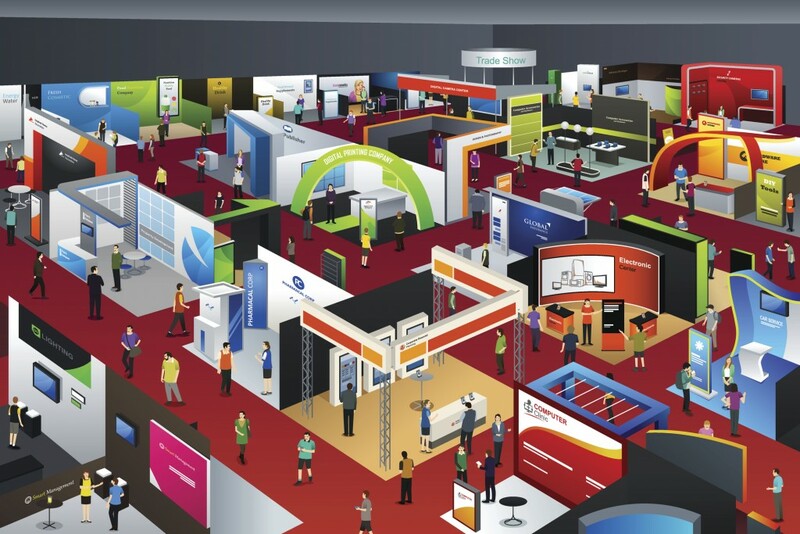 Many trade shows will provide a list of attendees to vendors. Contact them three or four weeks ahead, try to set up a meeting or attract them by offering a personal demonstration of your product or some other incentive. Follow up with an email blast a week before the show. Good pre-show planning also provides the opportunity to build your company’s awareness and credibility by arranging speaking opportunities (needs to be done months or even a year in advance) and setting up interviews with trade media at the conference. Wasting money on expensive paper brochures: Most end up in a trash can. Go digital. Offer your information on a thumb drive; better yet, offer to send it digitally after the show, but customize email communications so as not to appear generic. This type of follow up can be even more effective if you can identify the attendees’ needs while talking with him or her at your booth. This also allows you to collect business cards at the show, which can be added to your marketing database. Lack of post-show marketing: It’s amazing how many trade show leads are dumped in a file with nobody following up. Assign one person to ensure every lead is contacted within days, no longer than a week after the show, which will convey professionalism and efficiency and, many times result in sales. Otherwise leads go quickly cold. Provide an experience at the show, don’t just invite attendees into your booth to talk. If possible, allow them to interact with your products or experience your services which leads to customer engagement. Touch screens and interactive demonstrations generate interest and attract people to you booth. Finally, measure return on investment after the show and you have followed up. 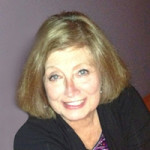 This will help you determine if the show is worth attending next year, or, you have to refine your marketing approach. Right now, there may be dozens, hundreds or even thousands of your customers and potential customers sharing information and experiences about your products and services; and about your competitors. There is probably no more useful information than customer feedback to develop effective marketing strategies, gain competitive advantage and increase customer satisfaction. And, it's right in public for you to see—online. More companies are listening online to monitor customers and competitors, but most are a long way from taking full advantage of social listening to increase satisfaction, build market share and develop competitive advantages. On the other hand, competitors are also using social listening to learn about your company, and developing their own strategies. Marketing today is increasingly driven by customers, true for both business-to-business and consumer companies. They have more choices. Shopping information sources are soaring, allowing companies and consumers to evaluate these buying choices before they are made. Consumers and customers constantly talk with one another online, sharing experiences, perceptions and recommendations, both pro and con. In addition, the vast majority of social media users rate “user generated content” as extremely credible, more trustworthy than advertising. They’re listening and paying attention to each other. 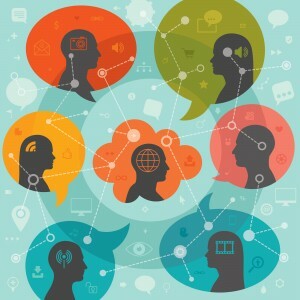 Social listening is now a must, not an option. Social listening is not an end onto itself. Social listening is an extension of your branding and marketing programs designed to provide timely, actionable information to help defend and extend your brand and build sales and market share and customer satisfaction. Data is just data unless it is analyzed and presented in a way that’s timely, useful and actionable. 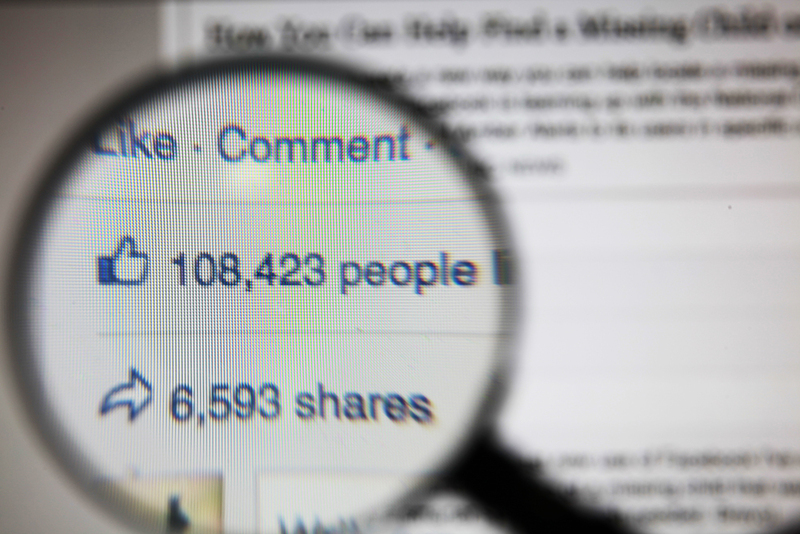 By analyzing comments you can gain vital insights and identify trends affecting your company and your industry. There are, however, important, and often missed, nuances to building a successful social listening program. It's vital to segment comments by various audiences. Whether they realize it or not, most companies have more than one audience. The most effective social listening strategies develop, understand and analyze strategies to reach your multiple target audiences. Understand intensity of social media comments; what drives customer action, as opposed to just talk. The more intense, the more important it is to take immediate action. There are very accurate approaches to measure intensity. Emotional comments often reveal drivers and pain points that prompt satisfaction and dissatisfaction with your company. Measure, understand and act on emotion. Social listening is just an exercise unless you do something with it. Social listening gives you the information to revise your marketing plan, if necessary, tweak promotions, develop strategies to turnaround dissatisfied customers, etc. They key is do something. 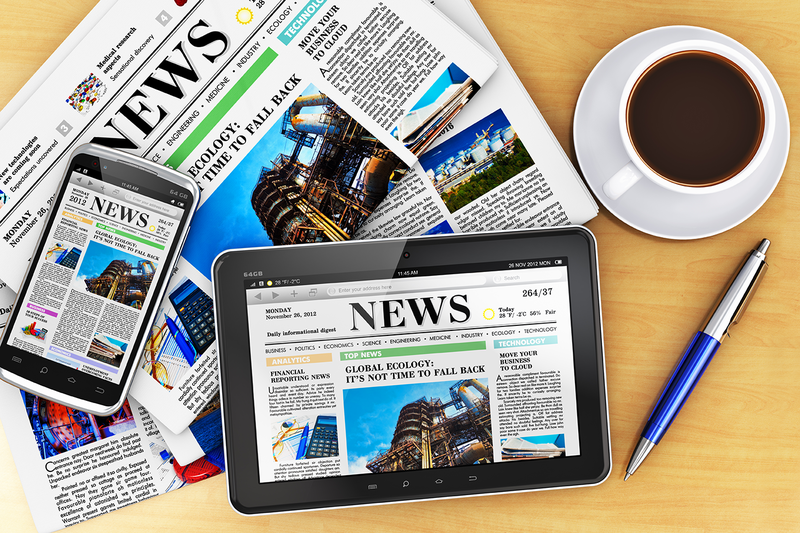 Newspapers need to do a better job differentiating their products; many consumers are confused what they’re offering, what content they provide, and on what platforms. Many newspaper brands have deteriorated; most consumers don’t consider printed newspapers, or their websites, as their primary sources of local news; which is a fact but wrong. 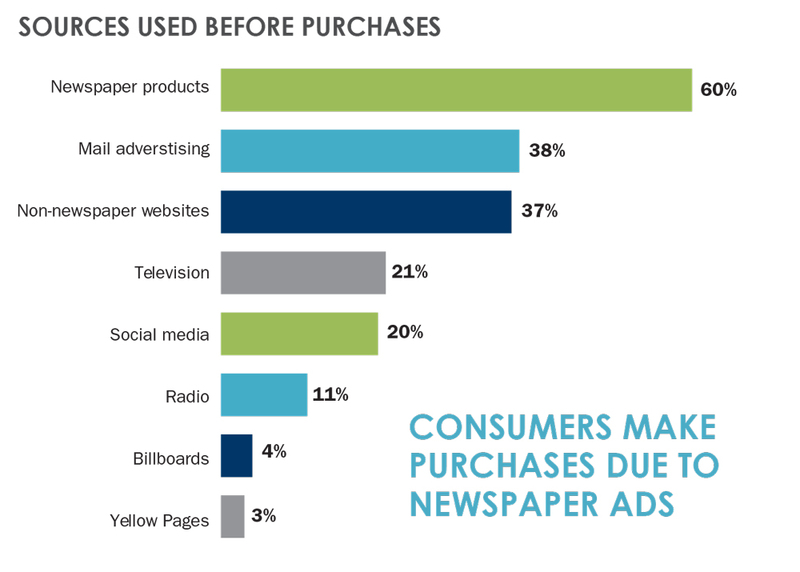 Newspapers not only do less marketing than many other industries, much of what they do doesn’t engage consumers, focusing more on product features than reader benefits; which are much more important. Fortunately, there are strategies to increase reader retention and frequency without breaking the bank. Digital may be the future, but print still pays the bills, so hold onto as many readers as long as you can. Our findings are based on thousands of interviews conducted in markets across the nation by American Opinion Research (AOR), of Princeton, N.J.
A large majority of former subscribers, and about half of current subscribers, believe printed newspapers and their websites provide pretty much the same information. And, sometimes they do right down to the lead story. 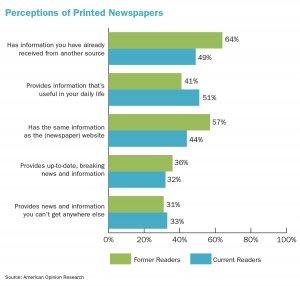 This perception is costing newspapers print readership and digital usage. One solution: develop a content plan to differentiate your platforms and exploit the benefits of both. Years ago, when I was Deputy Managing of the Pulitzer Prize-winning Times Union in Rochester N.Y., afternoon newspapers like ours faced a constant challenge: how to cover the news when the morning newspaper or television often had it first. The same is true today for the vast majority of newspapers; they are rarely the first source for breaking news, even local news. Like the afternoon newspapers of a generation ago, printed newspapers today need to be creative in developing “second day angles,” content that is more timeless, but still timely. Even feature stories should have a “news peg,” a reason why they’re in the paper that day. And, that requires a new plan for coverage. Even the venerable Times of London is cutting its breaking news coverage and moving to other types of content, including on its website. Early results look positive. Devising a content plan, just like a business plan, allows you to develop the most effective strategies, based on reader needs, carefully identify opportunities and, perhaps most important, make sure everyone on your staff is on the same page. One suggestion: people are looking for ways to enhance and improve their lives; AOR research shows that's what is most important to them. Newspapers have generally reported actions and issues, not answers, which feed the perception that newspapers don’t provide unique information and don't care, and, probably, adds to the appeal of television. You can change that, but you need a content plan that goes beyond brainstorming. That's not that difficult, but is something most media companies have not considered. This should help differentiate your products, an important priority mentioned in Part 1 of this article. When working with non-media companies, our research often focuses on identifying the “unmet needs” of their target audiences. Many newspapers take a different approach: looking for an audience that wants what they have to offer, rather than developing products people want to buy. Newspapers can distinguish themselves and be perceived as providing unique, useful information by identifying consumers’ unmet needs and providing that information. Measure the importance of very specific types of content consumers say they "must have". In a surprising number of cases, consumers have no one dominant source, even for content they care most about. This represents an opportunity. Newspapers tell their advertisers to market harder when times are tough. Most do just the opposite. There are many ways to market and promote without relying on expensive, external marketing plans. And, even those often tend to be poorly positioned and unproductive. A large New Jersey newspaper once ran an extensive, and expensive, radio campaign promoting the backgrounds and experience of its editorial staff members. The concept: build credibility in the people who bring them the news. Nobody cared, and it didn't affect image or readership. Consumers care what’s in the newspaper for them. This is the most important element of any successful marketing program, internal or external. Tell people why they should care. Upcoming and same-day content promotion in the newspaper can help retain subscribers and increase reader frequency among single-copy buyers and former subscribers, most of whom still read at least occasionally. For almost every product, in almost every industry, frequency equals loyalty. I’ve run several newsrooms and visited more than 100 others as a media researcher and consultant. The vast majority either don’t appreciate the importance of in-paper promotion, or need to do a more effective job. Upcoming content promotion: Build anticipation about the unique and useful information that’s going to be in the newspaper, tomorrow, the next day, Sunday, etc. Clearly, this won’t be breaking news, no longer the strength of newspapers anyway. But virtually every newspaper plans some content in advance. Focus on content that is useful, local and unique, and you can cut churn and increase retention. If you can’t identify any, there are bigger problems. How would many newspapers promote this story? Maybe something like, “Personal finance, Page 5d”; no direct promise of personal benefits, useful information and certainly not very compelling. Be short, to the point and engaging; again, promise personally important benefits. Start looking at magazine covers. Most are very good at this, because they live and die on discretionary readers which are more like newspaper readers today. These strategies are relatively inexpensive, but will be successful if done correctly—with the reader in mind. Perhaps the best advice I ever received about selling newspapers came from my old boss at USA Today, the late Al Neuharth, USA Today’s founder and then Chairman and CEO of The Gannett Co.
Al walked over to my desk in the USA Today newsroom one evening, handed me a piece of paper and said, “Every one of our stories needs to answer this question." For more on American Opinion Research, click here. Hold on to readers because print still pays the bills. 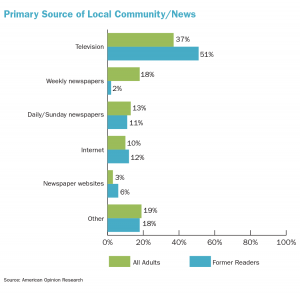 A significant percentage of subscribers are leaving print for news websites. No surprise here, except that many of these websites don’t belong to newspapers. You might be surprised, however, by other factors feeding churn. Lack of time is generally the primary reason quitters give for cancelling their subscriptions. But that’s just a top-of-mind response they give circulators on newspaper stop studies. Dig deeper, and we find that time isn’t even close to being No. 1. Cost is also frequently mentioned, but price has even less impact than time. 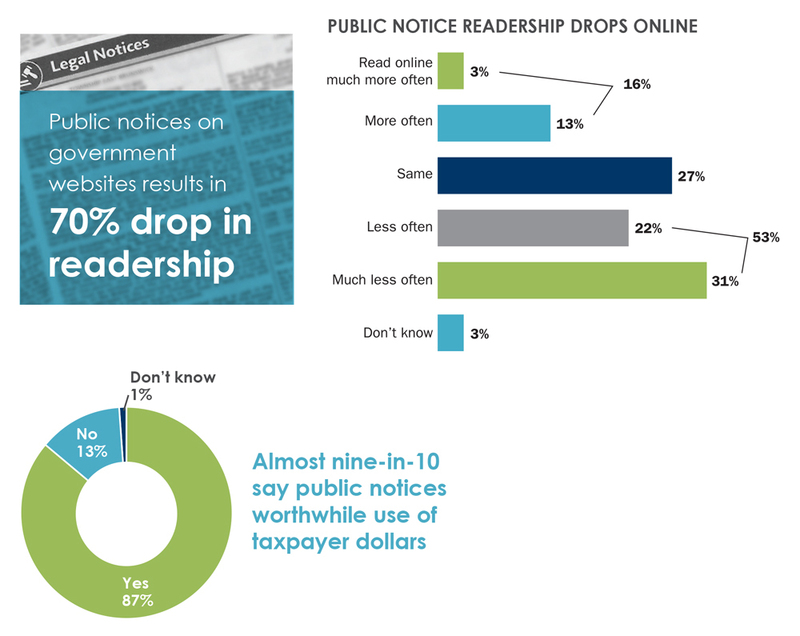 In-depth probing of former readers and subscribers by American Opinion Research (AOR) shows other, more fundamental reasons subscribers quit. These are costing you readers and revenue. Digital is probably the future, but print still pays most of the bills, so it’s vital to keep as many print readers as possible for as long as possible. There are ways to make this happen that won’t break the bank. The reasons many people quit have more to do with what consumers think of printed newspapers and their websites, and how they perceive them. Newspapers need to follow the lead of most other industries (automotive, for example) and do a better job differentiating their products, and then promoting the differences and benefits of each. Take a look at the chart (above), based on interviews by AOR with more than 3,000 adults from across the country. Almost two thirds of former readers say they have already received from other sources news that comes in the printed newspaper by the time they received it; and, almost as many say print contains the same information as the newspaper website. Perhaps more concerning, fewer than a third say the printed newspaper has news and information they can’t get elsewhere – one of our best predictors of readership and loyalty. 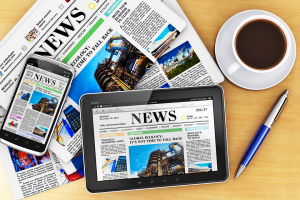 A relatively small minority say newspapers provide up-to-date news and information. Although not as dramatic, there are similar perceptions among current readers, which indicate the potential for an even more accelerated erosion of print readers. Almost half say they have already received news in the printed newspaper by the time they receive it; and, almost as many say it contains the same information as its website. 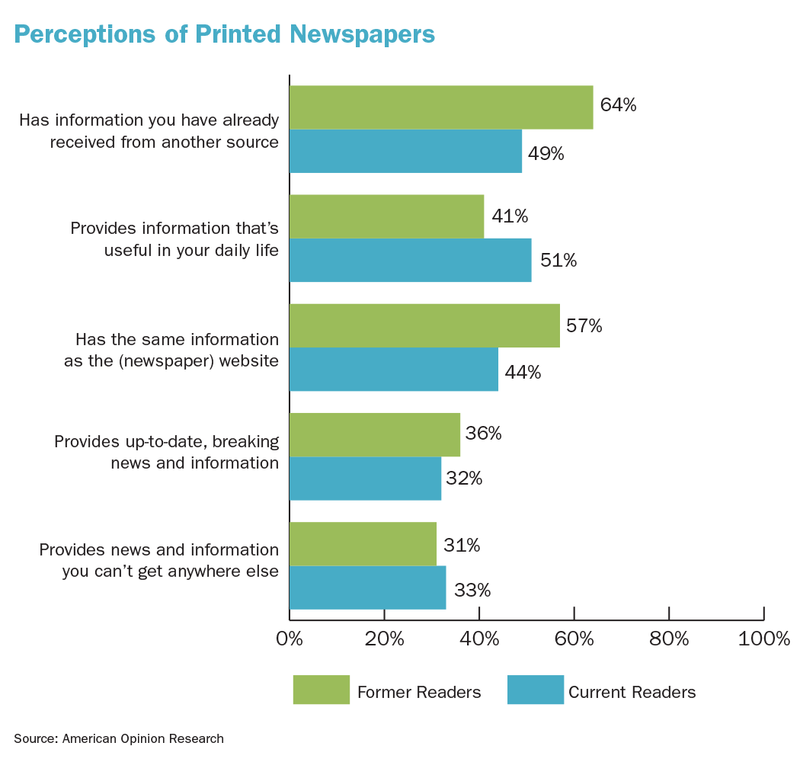 Only one-in-three current readers say the printed newspaper has news and information they can’t get elsewhere. Consumers are confused what you’re offering, how and on what platforms. It’s possible to convince some to read the printed newspaper and access your websites, but not the way they are now perceived. Editors have told me their practice is to continually update digital content (which they should), and then use the final version in print when the paper hits its deadline. That’s great for work flow, but not so good for building use of, and loyalty toward all your products. If your printed newspaper and website aren’t working together, they’re not working. Yet, almost every day I go online and compare newspaper front pages with their websites. And almost every day, I see front pages and websites that not only lead with the same content, but sometimes even the same headline. We’ve known for a long time that local news (defined in a variety of ways) is the No. 1 benefit newspapers can provide their communities. 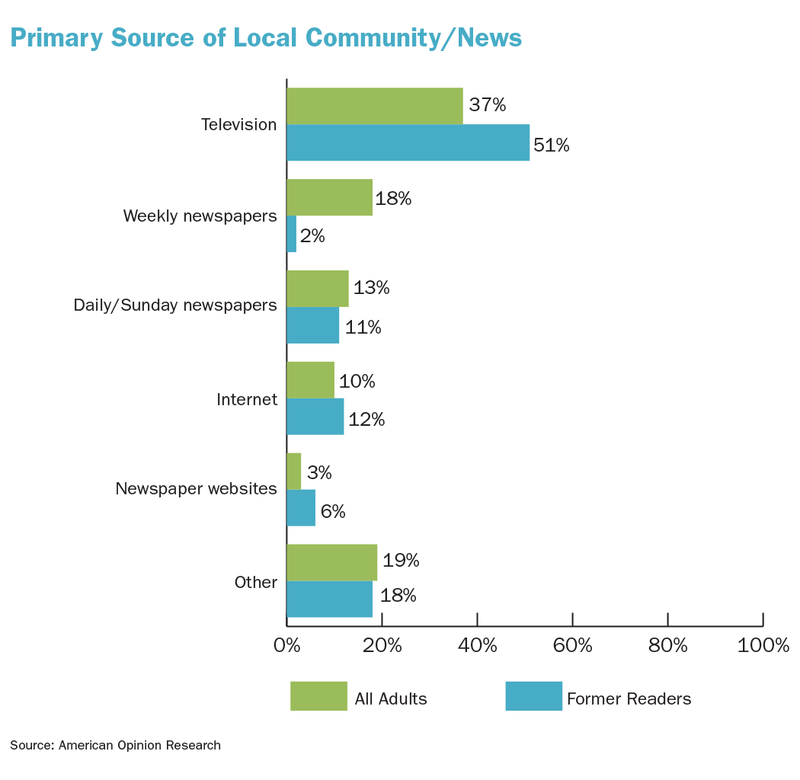 Yet, as shown in the following chart, consumers say they now rely on television for local and community news more than any other source. Does television really provide better local news content? But, that is the perception of consumers across the nation. It’s probably true in your market. As stated above, newspapers need to do a better job of differentiating their products. We’re talking with some newspapers on how to use research to develop new content strategies to exploit the unique benefits of each platform. It’s extremely unlikely printed newspapers will ever be the first with the news anymore, but there are other ways you can provide unique, useful information to retain readership. Television is very good at promoting itself, something newspapers (and their websites) need badly to improve. Unlike television, and most other consumer companies (and newspapers are a consumer product) when newspapers do promote and market they tend to promote their products, not the benefits to consumers of using those products which is all readers care about. Newspaper marketing budgets are not only dramatically lower than most industries, many marketing plans need to be better conceived and executed. Many simply don’t engage consumers. We provide suggestions in Part 2 of this article. For decades, newspapers have talked branding, but most branding programs have achieved very little. Consumers today are increasingly “expectation driven;” that is, they will use a service, or buy a product (including newspapers and access to newspaper websites) based on their expectation of what they will receive from it. They want personal, demonstrable benefits in exchange for their time and money. A brand is not a logo or a tagline, it’s the way you want consumers to think of you. A strong positive image will result in customer retention and increased reader frequency among former subscribers and single-copy buyers, many of whom still read the paper occasionally. As seen above, however, the image of most newspapers is not strong. Most consumer companies spend years building an effective brand image. Newspapers don’t have that patience. Many newspapers rely on Spring and Fall campaigns, with very little marketing in between. These are just some of the reasons printed newspapers are losing market share; but, they are little discussed but most important. Check out Part 2 of this article, and we’ll suggest some cost-effective strategies to change these perceptions and increase reader frequency. One result: lower readership and use of both. This is particularly true of younger adults, a vital audience if you are to build use of digital products. Our suggestion: audit content on both products to ensure they are complementary not repetitive; then, promote these differences on each platform. Future IMS Updates will discuss how to do this.